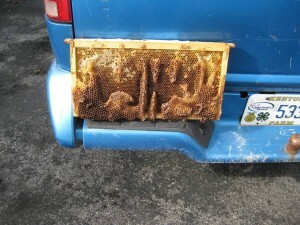 Posts related to beekeeping and/or honey bees, but not necessarily biology or hive management. Comments Off on Nine frames or ten in the brood box? Since the early colonists first entered Kentucky, honeybees have been a part of the state’s forest ecosystem. I recently authored an article, which has just been published, for Kentucky Woodlands Magazine entitled “Non- timber Forest Products: Beekeeping”. You may read in online at the Woodland Magazine webpage. Kentucky Woodlands Magazine is published under the direction of the University of Kentucky’s Department of Forestry Extension and the Kentucky Division of Forestry. House bill 136, a bill to remove Kentucky sales tax on beekeeping equipment, has been introduced in the Kentucky House of Representatives. For many years, Kentucky beekeepers have lamented that they must pay sales tax on beekeeping equipment, whereas other types of agricultural supplies are not taxed. HB136 is the latest of several attempts in recent years to gain a sales tax exemption for beekeepers. Leadership in the Kentucky State Beekeepers Association urges Kentucky beekeepers to contact their local state representatives and request that they support HB 136. However, the bill must first be approved by the Committee on Appropriations and Revenue. Thus, it is even more important to contact members of this committee, whether or not they represent your district, especially the chairman and vice-chairman. And time is short. Exempting beekeeping equipment from sales tax is a bit more complicated than many believe. In Kentucky, there is no comprehensive tax exemption for agriculture. Rather, KRS 139.480, which is the Kentucky statute that authorizes exemptions to Kentucky sales taxes, is a hodgepodge of exemptions, only some of which are related to agriculture. Most of these exemptions have been added one by one, through legislation similar to HB 136. Beekeeping is not the only part of Kentucky agriculture not favored with an exemption; most equine related expenses are subject to Kentucky sales tax (though many sales of young horses are exempt). If you look at the bottom of KRS 139.480 you will see the numerous amendments and additions made over the years. Quite honestly, beekeepers have not been excluded from some favored tax status for agricultural supplies – they have just not successfully lobbied and pushed for a specific exemption. Unfortunately, this is the way the political game is played.